Kyle was born in Blue Springs, MO. He lived Minnesota for a short 1 ½ years when his family decided to move back to Missouri to a small town called Warsaw. Kyle graduated from Warsaw High School and then attended Southwest Baptist University. Kyle met Anna at SBU and were married his senior. He graduated with a Bachelors in Christian Education with a concentration in Youth. 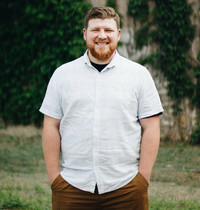 Kyle and his family have worked in student ministry in areas across Missouri as well as doing student ministry outside of Seattle, Washington. Kyle and Anna moved back to MO to be closer to family and is excited to be partnering with FBC - reaching students in the Owensville area while working along the side of parents. Kyle and Anna have two boys Gareth and Theo.